We're continuing to have weather-related ups and downs around here, and we're carefully monitoring the effectiveness of some new interventions. My attempts at writing about them have made Bud sound like a lab rat, which is not fair to him. So we'll be weathering (groan) this challenge privately for a while. The good news is that it hasn't all been bad. Bud has the delightful tendency to balance tough times by throwing himself wholeheartedly into fun times when those opportunities arise. And these days if the opportunities haven't arisen on their own, he's worked hard to create them. So it was one evening this week when he suggested that it was time to take a train ride. I am starting to learn to ignore the initial negative parental responses that pop into my head at suggestions like this: "Honey, we don't have a train... It's almost bedtime... You're being silly," and instead we put on our jackets and waited to find out what kind of adventure was in store. Bud was delighted. He gathered engineer hats for each of us and ran to find his slide whistle, then we all headed into the moonlit yard. 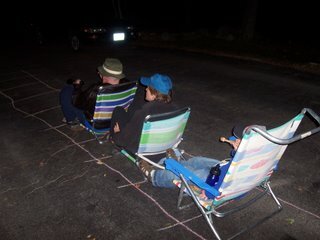 The set-up was surprisingly easy, and after the sidewalk chalk train tracks and beach chair engines were in place we were ready for our trip. My husband and I were in charge of the chugga-chuggas, and Bud - our faithful caboose pulling up the rear - was responsible for the choo-choos, with occasional slide whistle toots thrown in for effect. As neighbors drove by slowly (we could imagine, but not see, their bewildered faces), my husband called out cheerfully "Just playing train!" Bud played tour guide from the back, letting us know where we were headed and calling our attention to the sites as we passed them. It was a lovely trip through the neighborhood (where we saw moose, deer, and snakes), the jungle (where we saw monkeys and an elephant), the North Pole (where we saw a polar bear), and even the ocean (where we saw a whale). Our last stop was Dunkin' Donuts, conveniently located by our mailbox, where we gobbled Munchkins greedily and refreshed our weary-traveler bodies with delicious beverages - coffee for me, a Coolatta for my husband, and apple juice for Bud. Casey Jones, you better watch your speed. Trouble behind? Most definitely. Trouble ahead? Most likely. But somehow I think we're on the right track. We're sure to reach the station eventually, just as long as we keep chugging along together and following the lead of our intoxicating little boy. I just have to say I'm so proud of you for not listing to that immediate reaction we all have as parents. Looks like you all had fun going on a train ride. You've inspired me and next time Patrick says "lets fly in an airplane" I'm gonna say "lets get our coats"! Thank you for sharing this. What a great game! Bud is so imaginative. And you are such great parents to join right in! I know you'll weather any type of weather with smiles and hugs. i love the train ride! pull on in to our station and we'll hop on aboard!! still sending our best thoughts, as always. Bud is so lucky to have the very best "engineer" ever! He will keep this tucked away as a childhood memory and will smile to himself when his own children ask him to play train, on the sidewalk, at night. Not that I ever had any doubt but this just proves even more that you and DAD-NOS are fabulous parents. Bud is a lucky, lucky boy. Some parents would have said, "No, I am busy, just go play." and they would have missed out big time. Your story is such an inspiration to be a parent who is really involved and not just "around". Thanks for the story. Being busy is such an easy thing to do..well done. Since reading your post yesterday, I have had a lullaby in my head...train whistle blowin' all around the town...all bound for sleepy town many miles away...perhaps I should go have a game of train, and to follow a wonderful sleep??? I LOVE IT! I love anything where we imagine! How clever! He has a great imagination and such fun parents. mom-nos, this is a great post and made me think about my boys, and my occasional response to them, in a different way. Thank you.